My love for Gelato sprouted over at Millie Creperies, but I was at a loss after being singled out by the same ol’ Hazelnut or Vanilla flavour, over and over again. Although so close together, I am in-love with the surprising contrast that Chinatown, Kensington Market and Balwin Village have against eachother. My second time prancing through Baldwin Village in the daytime, it is a true delight. 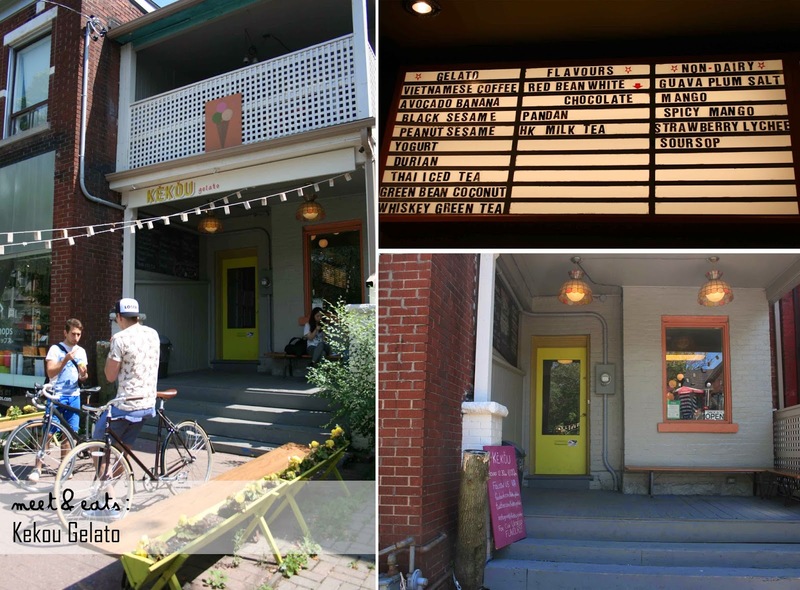 Introduced by a mate, Kekou Gelato is a small, darling gelato house in Baldwin Village. The Vietnamese Coffee, dang, this one packs a punch, just like my good ol’ Vy Vy Garden Cafe days (heh). How a Viet Coffee should be! Strong in bitterness and slightly sweetened by condensed milk. I found great delight in the Black Sesame, Green Bean Coconut and Red Bean White Chocolate – each are equally a safe bet for anyone, they are exactly how your taste buds imagine it to be – along with being creamy and rich with flavour. Slightly reluctant, but super curious, I went for the Spicy Mango, and man, it is pretty strong! I felt like a weakling. Legitimate Mango and Chili flavours here though, it’s fantastic! A quick whiff of the Whiskey Green Tea reminded me Karaoke – the memories of Cognac and Green Tea mixers, sticky floors and being enclosed in a large, dark room… I wouldn’t be able to handle any more than a sampler of this. 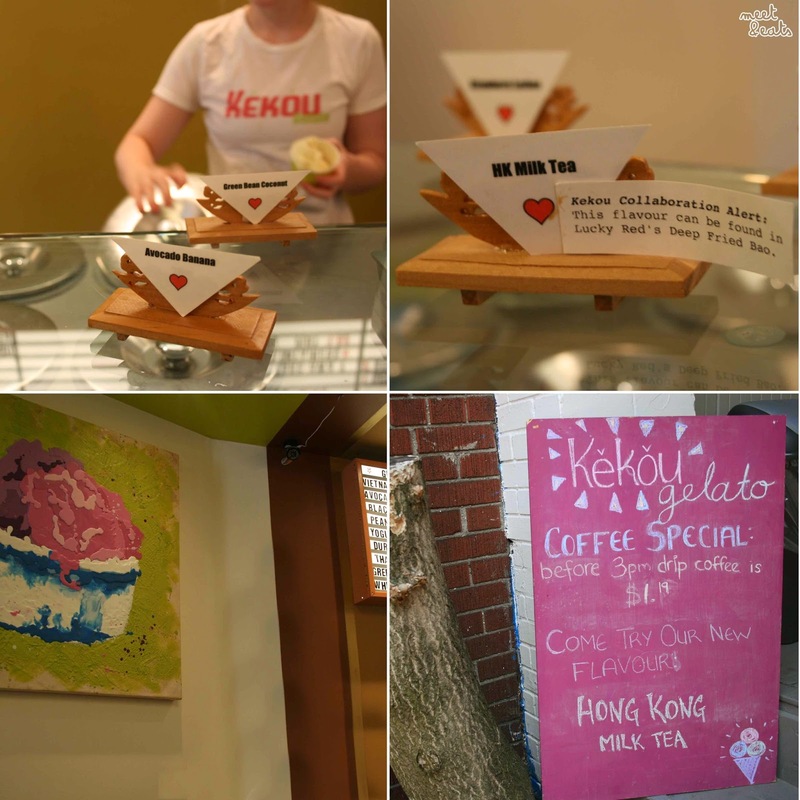 What enticed me to come back the second time around was the word going around that Kekou Gelato now serves HK Milk Tea! It was just how I like my Bubble Milk Tea ☺. The Thai Iced Tea was unfortunate, it had a slighty tangy aftertaste – odd, it was the first time being disappointed in any flavour from here, hopefully they improve it! Even though I’m feeling bad after sampling three+ gelatos, the staff are friendly and encourage the repetitive Kekou-ritual, I feel worse when I’m to toss out five sampler spoons though, there has to be a better way! The ★’s mark the ones that I think are brilliant – in the future, I will always have Green Bean Coconut in my cup. The Gelato either comes in a cup or cone. Two beautiful scoops in a Small or Medium, and three beautiful scoops in a Large. For Cones, they have it in Plain, Seaweed or Sesame Waffle Cones, at 1 scoop for $4 and 2 for $4.43! 1. Newly designed Gelato cups! Sips of Tea, Coffee (and Viet Coffee!) and other cold beverages are also available here. Pints of their awesome gelato are also available for $7.52/ea. 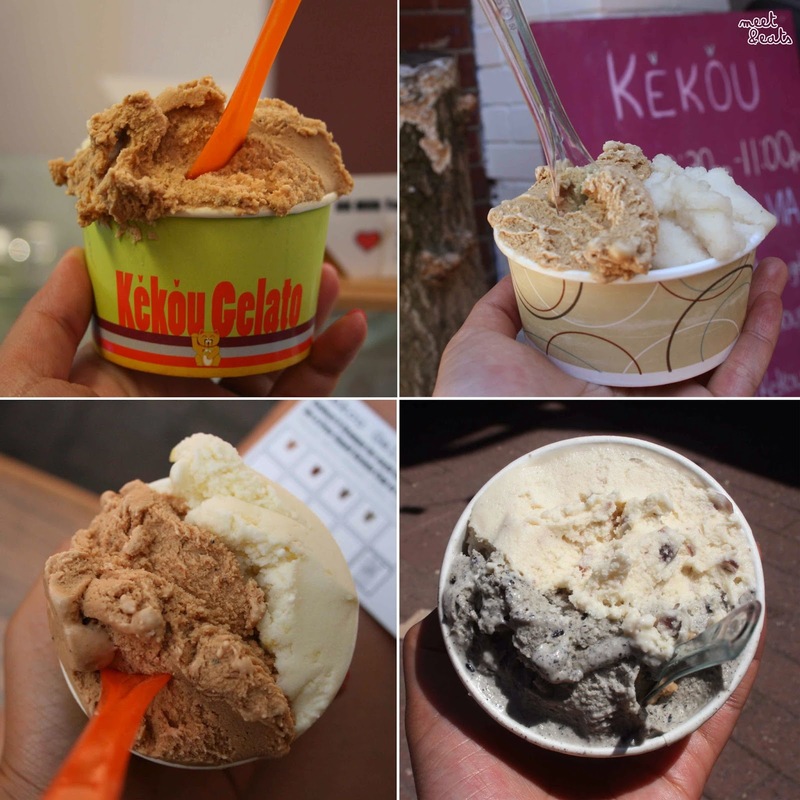 Kekou Gelato is incredibly original and their gelatos are all made in-house – I couldn’t ask for anything more! I would come here over and over again, it’s a delight to introduce new mates to this place as well, I love the same thrill that they get from here! It’s also a great treat after a meal at Kinton Ramen 😉 – look at me, I should just arrange people’s date day/nights!